Lying is the best policy… to get learners speaking! Here Is a summary of the content of my talk. It includes an overview of different activities that involve lying or secret information (some of which are ‘standards’, and others are my own ideas), reasons why lying might be a useful function/skill to practice in the language classroom, and a short plug of my latest book at the bottom. Enjoy! Alibi is a classic of the language classroom. Two learners prepare an alibi for an evening in the past when a crime was committed. They pretend that they were together for the whole evening, and agree in detail on exactly what they did for the duration of the evening. Then they are interviewed separately by the whole class, who ask the same questions to both of them. Any differences in their stories indicate that they are guilty. This activity is great fun, but logistically difficult to organise. It also usually involves whole class interviews, where a small number of learners do the majority of the speaking. A possible suggestion here is to put all the students into pairs to prepare their own alibi. The class then break into 2 groups, and interview pairs from the other group only. The pairs whose story has the most differences are ‘convicted’ as the criminals! An alternative activity of this type is the game called ‘Spy’, good at lower levels for practising basic personal information questions. Each learner is given a role-play card with personal information (e.g. name, nationality, job, telephone number, etc.) and has a few minutes to memorise this information. Learners split into 2 groups, and receive the personal information cards from the other group. They then interrogate all the members of the other group. The learner who remembers their ‘spy identity’ most accurately wins the game. This includes a number of activities, for example Call my Bluff and Two Truths and a Lie. There are many variations on this theme, the simplest of which is to get learners to write down 3 statements about themselves, 2 of which are true and one of which is false. Working in pairs, learners interview each other about all 3 statements, asking follow-up questions as required. Then they must try to decide which of their partners 3 statements is false. Learners can be asked to focus on a specific area of target language in their statements (e.g. going to / present continuous for future plans) if required. As in the classic UK TV show ‘Call my Bluff’ (search for it on You Tube), learners can work in teams to prepare 3 longer texts describing the meaning or origins of an unusual word or idiom, only one of which is true. Opposing teams must try to guess which one this is. See my book Teamwork (2004), Unit 11 – Raining Cats and Dogs, for ready-made materials for this activity. In this activity, played in pairs or groups, a nominated learner must talk about a topic spontaneously, after which other group members may ask a number of questions before deciding whether s/he was telling the truth or lying. A nice way to make this dynamic is to randomise the choice between truth or lie, for example by getting the learner to flip a coin. If it lands on one side, they tell the truth, and if it lands on the other side, they lie. Discussion topic cards, or personalisation cards can be used (see, for example, p. 117 in Speaking Games). Alternatively, a ‘ready-made’ version of this game can be found on pp. 60-61 of Speaking Games, or downloaded from my website. A type of ‘live listening’ activity, in which you, the teacher, tell the learners two or three stories from your past, one of which is false. Learners have to decide which one was false. As a variation, you could tell them just one story but inform them beforehand that it includes a lie, which they must spot. It’s a good way to retain learners’ attention during a live listening. It provides a reason for listening, and, as such, may lead to higher receptive skills awareness and the ‘noticing’ of new language, which can be embedded in the anecdotes. As well as Call my Bluff, there is a very popular UK BBC TV show called ‘Would I Lie to You’ (check it out on You Tube). It’s a basic Truth or Lie game, in which panel members receive an interesting fact about them or story from their past, which they must read out and pretend that it is true (irrespective of whether it is or not). The other team interview them and then decide if it’s true or false. In class, it can be difficult to do well, as the stories need to be prepared in advance. See pages 78-79 of Speaking Games for a possible solution on how to do this. These games involve secret information that creates an information gap of sorts. The secret information could be an unusual fact, a secret sentence or a taboo word. Question Taboo is one example of this (Speaking Games, pages 64-65 – download it from my website here), as is Definitions Taboo, in which learners must define a secret word without saying it or using several taboo words that would be useful in the definition (e.g ‘airport’; the 3 taboo words could be ‘plane’, ‘fly’, ‘travel’). Another really enjoyable game that can be played during a discussion or debate activity is called Secret Sentences (Speaking Games, pages 70-71), in which each learner has a secret sentence that they must smuggle into the discussion without the others realising that it is their secret sentence. All role plays involve lying in some way. A number of fun activities that involve improvised lying accentuate this interesting aspect of role plays, and challenge learners at higher levels to think quickly. Kangaroo Court (Speaking games, pages 76-77 – download it from my website here) is one example of this. The ‘accused’ must defend him/herself after being arrested for a rather comical or unusual crime, after which the other group members decide on an appropriate sentence. My earlier publication, Role Plays for Today (2006) provides a wide range of other ideas and materials for useful role plays for the language classroom. Very often in class, we teachers are required to come up with example sentences to demonstrate usage of a new piece of language (grammar or lexis). It’s possible to make this memorable and engaging by, rather than just giving a bland example, providing an interesting example that is insight into your past or personality. Learners suddenly become very interested, and ask: ‘Is that really true?’ Challenge them by asking them to raise their hand if they think it was true, and then them know if it was! The cognitive domain of Bloom’s taxonomy of educational objectives (e.g. Anderson et al., 2001) describes a range of thinking skills that are very well known in mainstream education, but somewhat neglected in TEFL/TESOL, presumably due to the often mistaken assumption that teen and adult language learners have already developed their full range of thinking skills. Personal experience leads me to suspect that many learners in both TEFL and TESOL contexts, due to a rather narrowly focused education, can benefit significantly by further practice of their higher order thinking skills. 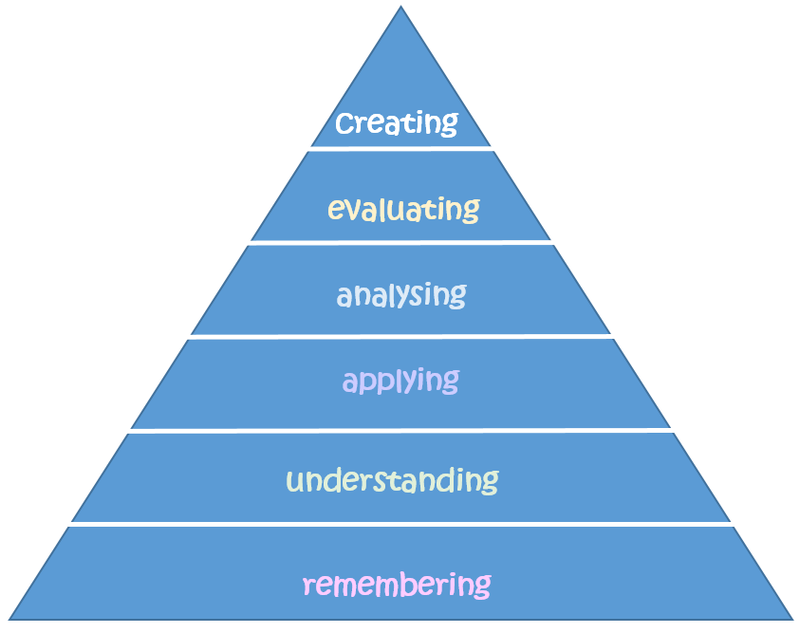 Lying comes right at the top of the ‘pyramid’ (here I’m using Anderson et al.’s 2001 revised taxonomy, which describes the skills as learner activities), as part of ‘creating’. When we attempt to guess whether somebody is lying or telling the truth, we are performing another higher order thinking skill; ‘evaluating’. Given that higher order thinking skills not only involve meaningful language use, but also a greater level of mental engagement, it is possible that they lead to more acquisition than activities that only require description or recall. It might be that, both ontogenetically and phylogenetically, the first function of language is the creation of imaginative worlds: whether lies, games, fictions or fantasies. For us to pull these off successfully, we have to be surprisingly good actors. We need to attend to body language, facial expression, proxemics and non-linguistic vocal sounds – i.e. paralanguage – something that is so important for successful communication, yet surprisingly difficult to get into the classroom. By including activities that depend on successful paralanguage in our lessons, such as lying/deceiving, we are likely to develop learners’ awareness of the interactional function of language, thereby enhancing their ‘emotional intelligence’ (if there is such a thing) as a result. Aside from the importance of this to their language learning in general, an additional benefit is the likely improvement in relationships and rapport that may result in the classroom community. I have devoted one of the 4 sections of my photocopiable resource book for English language teachers, Speaking Games, to games that involve telling lies and guessing secrets. Go to my website and click on the Resources for Teachers section. You will find the Contents page for this section, and 3 example games from the workshop. If you do make use of these, please let me know how they go – I’m always interested in feedback. Click here to go direct to the PDF download from the talk. Anderson, J. (2004). Teamwork: Interactive tasks to get students talking. Peaslake, UK: Delta publishing. Anderson, J. (2006). Role plays for today. Peaslake, UK. Delta publishing. Anderson, J. (2014). Speaking games. Peaslake, UK. Delta publishing. Anderson, L. W., Krathwohl, D. R., Airasian, P. W., Cruikshank, K. A., Mayer, R. E., Pintrich, P. R., et al. (2001). A taxonomy for learning, teaching, and assessing: A revision of Bloom’s Taxonomy of Educational Objectives. New York: Longman. Brown, G. & Yule, G. (1983). Discourse analysis. Cambridge: Cambridge University Press.